Can your Child Speak in Public? Speaking is an art! Public speaking is an intricate art! Speaking is an art! Public speaking is an intricate art! Imagine this. You have been asked to say just a few words, for just a minute, on a topic you are most familiar with. You have practised several times in front of the mirror and also in front of the family audience, so much so that the words just tumble out of your mouth effortlessly. Your practice sessions have been absolutely satisfactory and you are ready to go. The moment has arrived and there is an announcement of your turn. Here you are, standing on the stage facing the audience (however small it may be). All of a sudden a chill runs down your spine. Your mouth goes dry. You can almost hear your teeth chatter and your knees knock against each other. Sweat trickles down your temples. And, to your utter horror, the words that came in a smooth flow a few minutes back simply refuse to come out. You draw a blank! Believe me my friend, we have all gone through this. Even the greatest orators have experienced moments of fear on stage that churned their stomachs. When such is the case with adults, is it any wonder that children have it too? 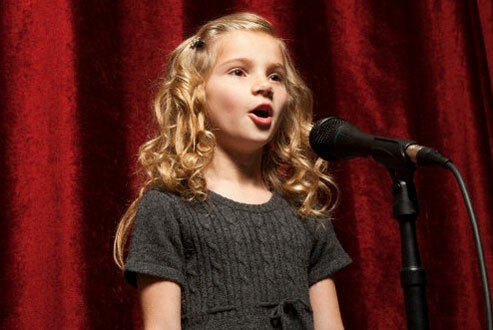 But for a few exceptions, most children have stage fright, which is a very common kind of fear among children. So it is but natural for parents to wonder whether their child can be a public speaker, one with no fear. Remember, ability to speak to an audience with no fear isn’t a measure of your child’s success. Though it may give an edge, the lack of it does not necessarily downplay a child’s other talents or work as a deterrent to his growth. Your son or daughter is not the only child with fear. And, the good news is that this fear can be overcome and your child can come out triumphantly, with the right kind of support and encouragement. Giving you an insight on development of public speaking in children. Just like the development of language and communication at an early age, training in public speaking skills should begin fairly early too! Encourage the onset of public speaking at home! You can help your child with informal speaking in a group. For example, a child can talk about his or her recent holiday experiences. To work more on improving communication, you could encourage communication with a vendor; attending the courier man; answering the phone; etc. It is not necessary to wait until your child is chosen for public speaking in school. Communication is not just essential, it is critical. One way or the other your child has to speak, present and perform throughout his/ her life. Development of public speaking skills begin with letting the child talk. When the child communicates without hesitation and interruptions, language skills are improved. A child with poor language skills, lacking confidence, may not speak in public. So, as a parent, it is important for you to part take in the development of these skills and build the child’s confidence. You could ask simple questions and let the child answer, and also encourage the child to ask questions. Here, it is important to note that to speak effectively, one must acquire mastery over the language. Of course, that is not something that can happen overnight. Continuous efforts must be on to learn the concepts of grammar, improve vocabulary, and learn the right diction, tone of voice and mood. Remember the good old saying, “Practice Makes a Man Perfect!” If your child has never done public speaking, make sure you help with practice. It may not be a good idea to let a child address a crowd without any training. When I say practice, I mean an ample amount of it. It could be done as a fun activity without making the child feel suffocated by it. One idea is to have a gathering of children from the neighbourhood. This, I must say, should be done only once the child has learned his/ her lines thoroughly. This by itself can boost the morale of the child. As a regular routine, get the neighbourhood children to gather at your place, give them each a word and let them speak about it for a minimum or half! You could think of small gifts for the best speaker. Your neighbours will be more than willing to send their child to participate in this activity. You will be surprised to see how they come forward to help you organize similar gatherings in the future. Run a mock show! Children who prepare for public speaking need an audience. Categorizing children age-wise to be the audience can make it more interesting for the little speaker because he/ she is able to connect with the audience easily. Shower the child with encouragement. Never criticize. Appreciate your child! Keenly observe the areas where the child needs improvement. Get feedback from the audience and try to incorporate suggestions. Set a goal and reward your child when the goal is achieved. Don’t force your child when he or she is not ready.